Director/Writer: David Winters / Writers: Judd Hamilton & Tom Klassen / Cast: Caroline Munro, Joe Spinnell, Judd Hamilton, Glenn Jacobson, Mary Spinnell, Devin Goldenberg, David Winters, Stanley Susanne Benton. 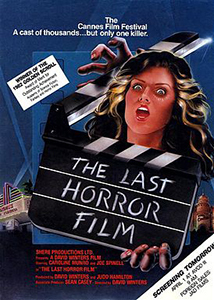 This cheeky cheapie was shot at the 1981 Cannes Film Festival and, while it uses this backdrop well for a series of mysterious disappearances accredited to lonely filmmaker Spinnell, it never really finds itself, balancing somewhere between horror and outright parody. The latter is quite plausible as it’s the reunion of Munro and Spinnell post-Maniac and even features Joe’s own mom! What prevents this from becoming nothing but a European retread of the Lustig flick is the fabulous – though thoroughly understated – final twist which you really don’t see coming. Munro is good as cheesy horror actress Jana Bates, who is voted best actress out of a list including Meryl Streep and Faye Dunaway, while she sports a Bride of Frankenstein-esque do. Spinnell is desperate to get her to star in his film and will do just about anything to ensure a private audience with her – even kill? The film also makes radio broadcast analogies with real life stalkers and attempted assassinations with inserted slick jokes here and there; my favorite being Munro’s frantic escape from her hotel room into the lobby where the crowd thinks it’s all a publicity stunt as she sprints by in a towel! I like this movie; it’s cheesy yet with the right touch of warmth, both the gooey kind and the kind you’ll feel at its silly twist.